What would we do without our friends? Well, it depends. If they aren't good friends, you could flourish and grow without them. But if they are the right friends, they will help you become the best version of yourself. 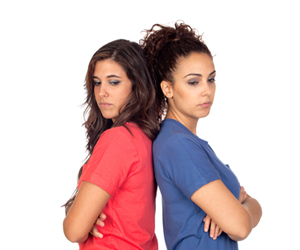 Here are some characteristics of a toxic friendship that should be red flags for you. Obviously, you are going to want to hang out with your BFFs all the time, but sometimes it's healthy to branch out and meet some new people every once in a while. You never know, they could be a new addition to the squad! If your other friends get angry for you hanging out with your new friends or you feel that they are trying to find these wrong with them, then this could mean they are territorial. If they really care about you, they will understand that it's not healthy to not want you to make new friends. A true friend will sympathize with you when you are down and in turn, they will be proud of you during your success. Obviously, you aren't going to agree on everything, but if you notice them making a big deal out of something that shouldn't be, call them out on it. This is a major red flag because they are missing the whole point. Friends are supposed to pump you up and make you feel fierce even when you are going through a tough time. Maybe this is just a personal pet peeve, but if you make plans with someone and they ditch you last minute because something more interesting came along, they are a trash friend. If your friend does any of these, maybe it doesn't mean they are necessarily a bad friend, but just aren't being the greatest friend at the moment. Don't be afraid to have a nice talk with them and get real. If they can't listen, that's something they need to work on.